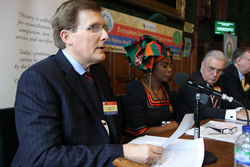 UNIVERSAL PEACE FEDERATION - EUROPEAN LEADERSHIP CONFERENCE. Mr Chairman, Distinguished Participants and Fellow Panellists, Dear Ambassadors for Peace, Ladies and Gentlemen. First of all, allow me on behalf of Universal Peace Federation as co-host and co-sponsor of this event to offer a warm welcome to each and every one of you. Thank you for giving up your precious time to be with us here today helping us all to properly address this important question of how effective democratic nations are in upholding Human Rights. It is heartening to see so many of you here today because it is a strong confirmation of how much people really care about how their fellow human beings are being treated and how much we all long for a better world. From this you can understand that from a UPF perspective human rights is almost always thought of too narrowly as gross and obvious violations or abuse of one person, or one group, or one nation by another, usually sanctioned, or at least condoned, by the state or other authority. It is usually such abuses that capture headlines and attract comment in the media as being violations of human rights. However to understand the extent to which human rights are observed and respected (especially in democracies) I would suggest that we need to view it the far broader context of how human beings in a particular society treat each other and what attitudes they harbour towards each other. This is because in a democracy, even though rights may be well enshrined in law and the citizen entitled to great protection under that law, we know from so many recent examples in this country that democracies are often little able to enforce those rights or protect abused victims due to lack of law enforcement capacity or resources. The key question, I would suggest is how much are human dignity and human worth respected in our societies regardless of where the law stands in relation to them. We have many safeguards and proclaim many standards but there is a terrible and growing tendency for them to be defined more in the breach than in the observance. But let us start by giving Democracy its due and by recognising what’s good about democracy as far as protecting Human Rights is concerned. Let us recognise that democracies are relatively good at defining rights and liabilities, at passing legislation to protect different groups, including minorities. Let us also recognise that of all the social systems in history democratic systems have succeeded in giving people the greatest number of people access to greater levels of freedom and prosperity than others. Let us also recognize (to paraphrase Winston Churchill!) that democracy is almost certainly the least worst form of government. However, we must also recognise that democracy is by its very nature inherently limited because as a system it is ethically and morally neutral. It believes in pursuing the will of the majority. But, for goodness and righteousness to prevail it is necessary for that majority to adhere to what is just and righteous and as we know well that is by no means always the case! Ladies and Gentlemen, in short the inherent weakness of democracy is that it relies so heavily upon there being a sufficient base of morality and of course education and knowledge among citizens in any given society to ensure that good collective decisions are made through the ballot box and by government generally. If we ask ourselves how this applies to modern democratic societies such as that here in this country and in Europe generally I suggest that there is truly deep cause for concern. Whilst we continue to adhere to the principles of democracy the base of morality within society gives every appearance of crumbling before our very eyes and it is this phenomenon that in my respectful opinion gives the greatest cause for concern about human rights. We may adhere strictly to democratic principles but if we do not do something to reverse the moral decline it will avail us little. Abuse of the elderly in care and neglect of those living on their own. In most cases where abuse has been revealed there were clear laws or regulations against the offensive conduct . But those laws and the agencies charged with enforcing them could do little in themselves in the face of the lack of moral sensitivity or conscience on the part of the perpetrators who thought nothing of systematically violating the human rights of others in the narrow pursuit of their own self interest! All that we truly have control over is ourselves. So we need to keep up our own attitude and level of conduct towards others at all times as one of our key contributions to society. What can and should we do beyond our basic contribution in this way? Nothing short of a major general effort and consensus to re-moralise societies. A realignment of all those groups in society committed to more traditional moral and ethical values.There needs to be a great alliance of like-minded individuals and groups to bring about a moral re-awakening in our societies. We should recognise the importance of the family in nurturing the values, the ideals and the heart that enables all people to respect each other and to value each other. We are our brother's keeper and we are born to live for the sake of others. We need to do everything we can to strengthen the family as a social unit and protect it from all the forces that are undermining it. The family is where, more than in any other social institution we can learn the attitudes and principles that underpin the right treatment of others. If we don’t learn to love and respect others growing up in a loving family we will most likely never learn how to love others beyond our own family and thereby contribute to a society based on respect and love for others where violations of one human being by another do not occur. We should also recognise the importance of religion in nurturing the values that lead to the observance of human rights (respect and love for others, service, self sacrifice and living for the sake of others). To achieve true human rights we will need a revival in religious, spiritual and moral values. We need to realise the value of religion as a force for spreading right attitudes and behaviour and its potential for leading the struggle to re-introduce moral values into society. We need to encourage religious leaders to stick to their guns by not accommodating to selfish social trends that undermine both morality and family and by no being afraid to speak out about such issues, which sadly seems to be happening. In conclusion, Ladies and Gentlemen, in our respectful opinion democratic societies do not have that much to be proud of if their decisions are not deeply rooted in morality and altruistic thinking.